A SpaFetish® Soap Log is the perfect solution for anyone who wants to slice up their own natural soap bars! Our Soap Log (sometimes called a Soap Loaf) weighs an impressive 2.75 lbs to 3 lbs and is as easy to cut as a loaf of fresh baked bread. What is more, to make your slicing endeavors easier, we offer the perfect soap slicing utensils that will quickly shave down each Soap Slab into standard size 4 oz. 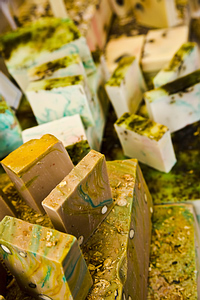 natural soap bars. Our Soap Logs should yield up to 10 – 4 oz. bars, with little effort. And, don't you dare discard the end pieces! Trust us, they are a joy to be savored -- as they make delicious leftovers, long after your Soap Loaves have come and gone! Here, our Rose Soap is served in whole 3lb Soap Log. The Rose Soap Loaf is drenched in organic Roses that pair well with a delicate note of Geranium Essential Oil to render a completely natural soap. Five gratis shower puff sponges are included. 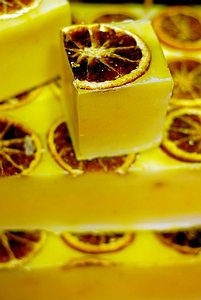 Here, our Orange Soap is dished up in a 3lb Soap Log. The Orange Soap Loaf is redolent with organic Oranges, Mandarin Essential Oil, Vitamins and a generous dose of Shea Butter to render a completely natural soap. Five gratis shower puff sponges are included. 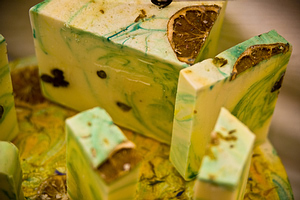 Here, our Mandarin Lime Soap is presented in a 3lb Soap Log. The Mandarin Lime Soap Loaf is oozing with organic Mandarin and swirl of Kaffir Lime Essential Oil, Vitamins and Shea Butter to render a completely natural soap. Five gratis shower puff sponges are included. 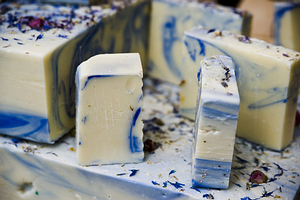 Here, our Blueberry Soap is offered in a 3lb Soap Log that is bursting with organic Blueberries, Vitamins, Aloe Leaf and Shea Butter to render a completely natural Blueberry Soap. Five gratis shower puff sponges are included. Here, our Patchouli Vanilla Soap is nestled in a 3lb Soap Log that is rife with Indian Patchouli and organic Vanilla Bean Essential Oil. 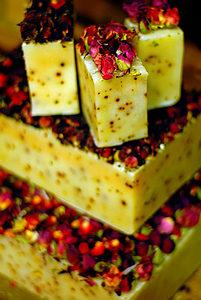 A generous layer of Vitamins, Aloe Leaf and Shea Butter works in unison to render a completely natural Patchouli Soap. Five gratis shower puff sponges are included. Cut perfect soap slices -- fresh off the log -- every time with our soap slicer. 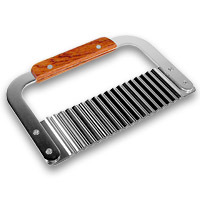 Like butter, the slicer glides through each Soap Log with ease and precision. It's a must for soap enthusiasts who like clean-cut soap bars. A gratis 5 oz. natural soap bar is included.